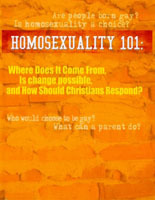 DVD: Homosexuality 101: Where Does It Come From, Is Change Possible, and How Should Christians Respond? 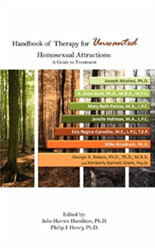 This educational DVD provides Christians with important information on the topic of homosexuality, including: an overview of the factors that can contribute to the development of homosexual attractions, testimonies by two former homosexuals, a testimony by a parent, and a discussion on how Christians should respond to this issue. To order this DVD, click here. This book provides clinical theories and techniques from a number of psychologists and therapists. Each professional presents his or her approach to psychological care for clients distressed by unwanted homosexual attractions. While this is not an exhaustive collection of methods, it provides a variety of effective approaches.